Borderlinx | Buy JoyBuy and ship worldwide with Borderlinx. Cheap rates guaranteed. 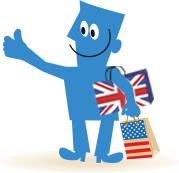 JoyBuy is an English language site operated by JD.com, the largest retail sales company in China. You’ll find top quality products from a wide range of categories, including personal electronics, fashion, shoes, jewelry, toys, books and outdoor gear at competitive prices. Shop JoyBuy’s Super Deals section for flash sales updated every day. Savings reach up to 70 percent on cameras, headphones, speakers, smartphones and even everyday items such as toothbrushes, kitchenware and more. When you need shopping inspiration, check out the Tech Trending section for weekly recommendations from the JoyBuy team. JoyBuy is a great retailer to discover brands from Asia. Plus, you’ll never run out of opportunities to save! Shop JoyBuy in Hong Kong and ship worldwide to your home with Borderlinx. It’s an easier way to ship internationally. Use the Borderlinx Shipping Cost Calculator to estimate international shipping fees and taxes & duties to your country. Borderlinx has all the tools you need to painlessly ship JoyBuy internationally, including concierge, free repacking and package consolidation.